It comes now from the US Energy Information Agency, and is headlined by Bloomberg Business, so yes, it’s official. 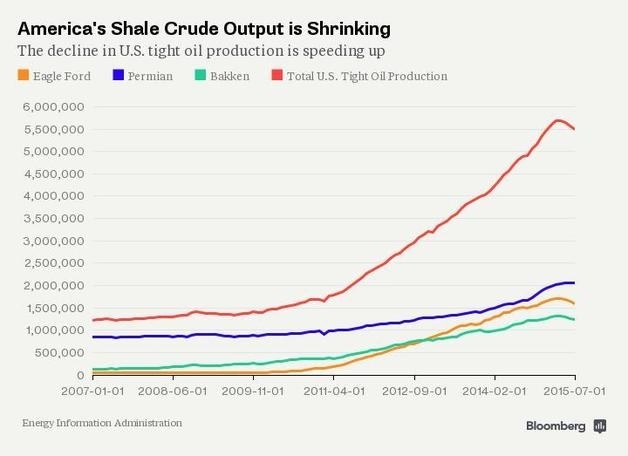 As Bloomberg put it, “US Shale Boom Grinds to a Halt.” Which, actually, is overstating the case by a good bit, there isn’t going to be a “halt.” Nevertheless, as sane people everywhere have been insisting for years, the shale boom is, as it always was going to be, a bust. Editor: this is it folks, global peak oil is knocking on the door. We do expect oil prices to substantially rise again, somewhere between now and the end of next year. Art Berman talks to HGS about his research into the economics of unconventional plays. He tells the audience that the ultimate reserves of shale oil and gas are limited, and overstated to the general public. Recorded February 23, 2015. Slides from this presentation can be downloaded from here. 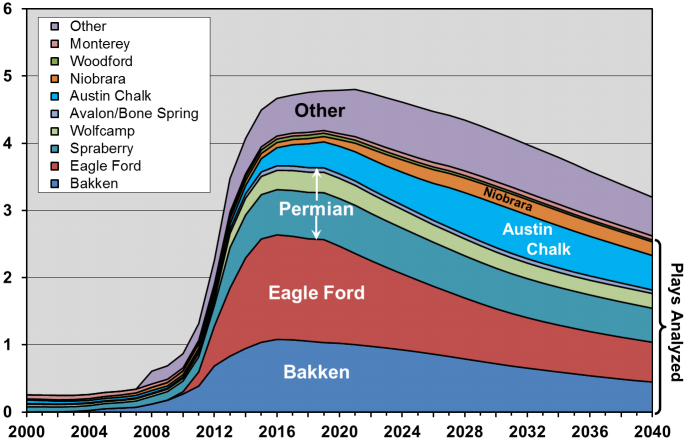 Oil projections for US production from all sources according to the EIA. ‘Most likely’ production scenario according to the Post Carbon Institute compared with EIA findings. The Post Carbon Institute critically examines the findings of the EIA report about “Light Tight Oil projections”. Editor: the days that we take everything the Post Carbon Institute says for granted are over. Three years ago we started this blog in the expectation that ‘peak oil’ would start to bite soon. It did not, at least not in terms of supply contraction. Ten years ago, after an imprudent diet of Richard Heinberg literature we proclaimed to everybody who wanted to hear that ‘in ten years time Joe Sickpack would not drive a car any longer’. That was obviously wrong. Although there are signs that we approaching ‘peak car’ in terms of car ownership and miles driven, at least in the West (young westerners no longer have car ownership as a high priority), many roads are still congested. It is obvious that the practice of fracking does indeed provide a substantial ‘delay of execution’ of peak oil and hence of the old industrial society with at least a decade. But there are other reasons why peak oil watching and barrel counting has become less prominent on our agenda. It seems that peak oil is not going to be the ‘next big thing’ in the coming years. Financial and geopolitical developments are more interesting. Interesting as in catastrophic. On a positive note, all the technological preconditions for a ‘solar economy’ are already fulfilled. From now on it is a matter of investment decisions. Peak oil, yawn. 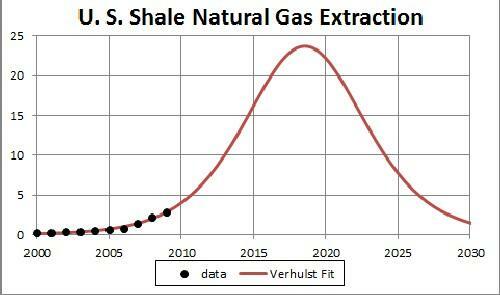 Bad news for those peak oil deniers who had hoped for a bright future with endless supply of shale oil. US authorities downgraded by 96% the estimated amount of recoverable oil buried in California’s vast Monterey Shale deposits, deflating its potential as a national “black gold mine” of petroleum. 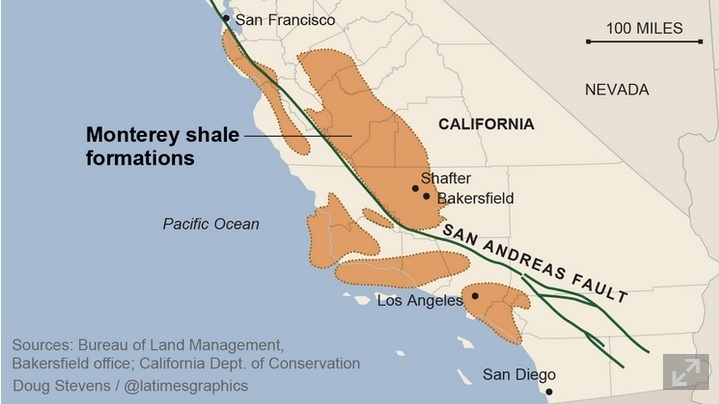 The Monterey Shale formation contains about two-thirds of the nation’s shale oil reserves. So, not 13.7 billion barrels are recoverable but merely 600 million. We repeat: Peak Oil 2018. 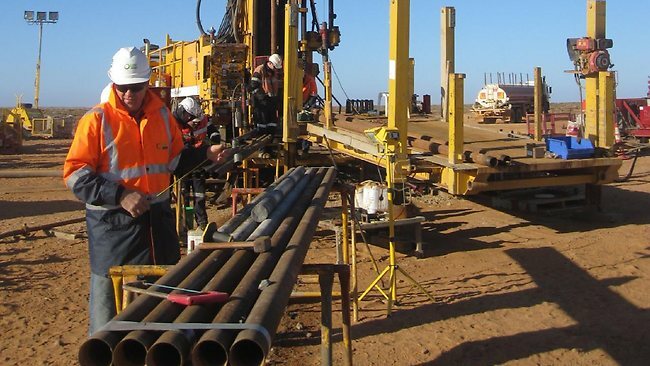 $20 Trillion Worth of Shale in Australia? 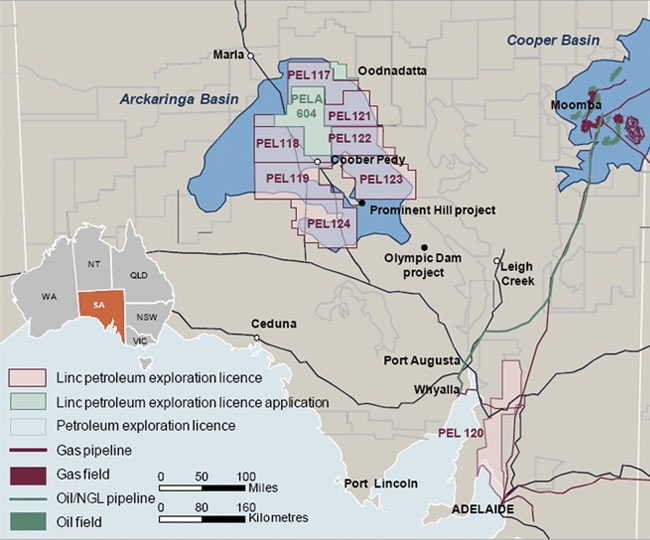 Brisbane company Linc Energy recently released two reports, based on drilling and seismic exploration, estimating the amount of oil in the as yet untapped Arckaringa Basin surrounding Coober Pedy ranging from 3.5 billion to 233 billion barrels of oil. An analysis of the energy return on investment (EROI) of natural gas obtained from horizontal, hydraulically fractured wells in the Marcellus Shale was conducted using net external energy ratio methodology and available data and estimates of energy inputs and outputs. 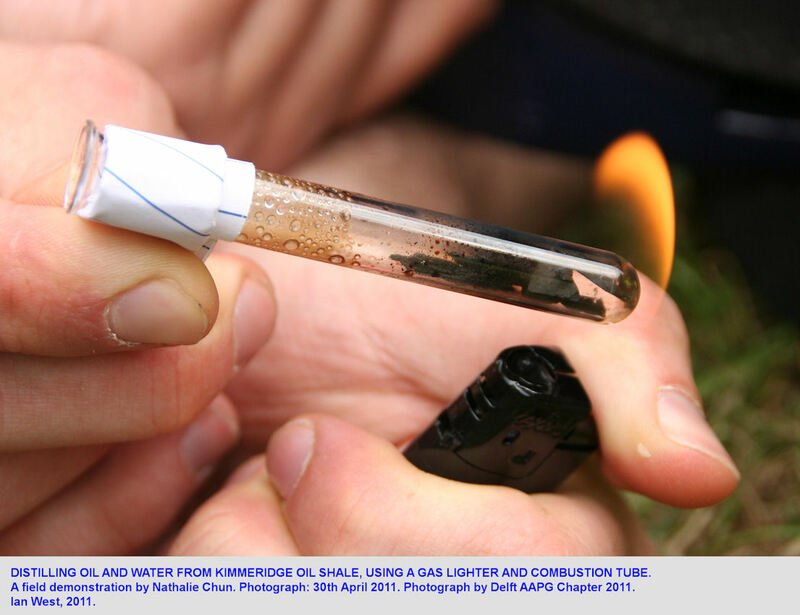 Used as sources of input data were estimates of carbon dioxide and nitrogen oxides emitted from the gas extraction processes, as well as fuel-use reports from industry and other sources. Estimates of quantities of materials used and the associated embodied energy as well as other energy-using steps were also developed from available data. Total input energy was compared with the energy expected to be made available to end users of the natural gas produced from a typical Marcellus well. The analysis indicates that the EROI of a typical well is likely between 64:1 and 112:1, with a mean of approximately 85:1. This range assumes an estimated ultimate recovery (EUR) of 3.0 billion cubic feet (Bcf) per well. EROI values are directly proportionate to EUR values. Shale Gas Revolution In Europe? 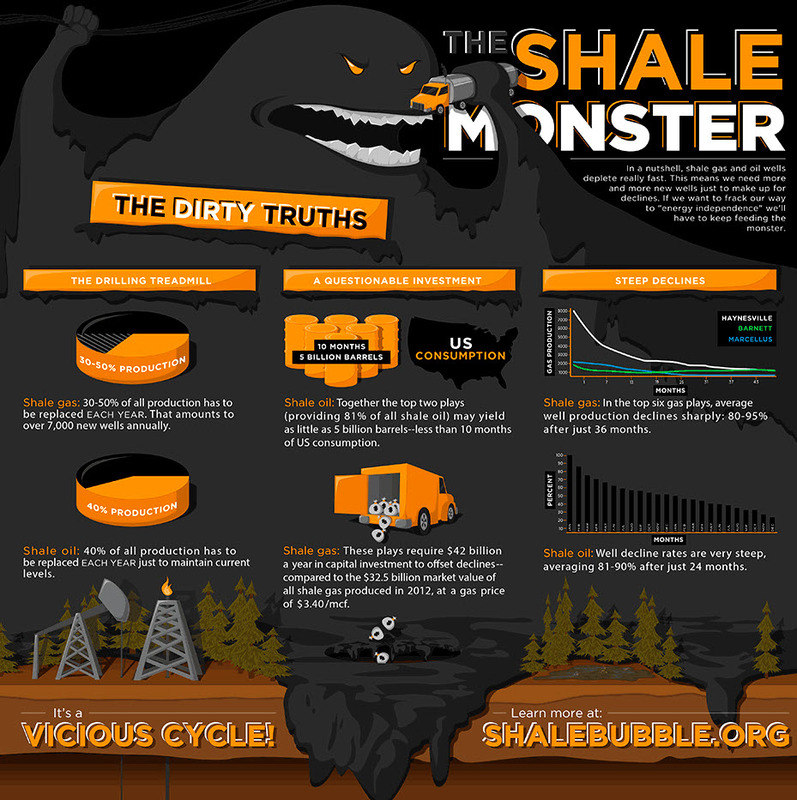 Some in Europe want to mimic the developments in the US and start to exploit shale gas in Europe as well. The result would be that like the US, Europe would adopt a kicking the industrial can further down the road attitude and avoid dealing with very tough questions now. The world is running out of fossil fuel anyway and exploiting shale gas merely means delay of execution. The only way that shale gas can be justified is by using every calorie contained in that gas for setting up a new renewable energy infrastructure. The goal of any sensible energy policy would be to have solar panels on every roof as quickly as possible. The German example of the Engergiewende is the way to go forward for the rest of Europe. In 2007 William Engdahl, the historian of oil politics, surprisingly dismissed any idea of peak oil, and bought into the abiotic origin of oil and concluded that peak oil was a myth. He repeated this opinion only one year ago and attributes high oil prices not to scarcity (‘peak oil’) but speculation. With this background we are surprised that earlier this week Engdahl did dismiss the hype around shale gas in globalresearch. Like many others he stresses the toxic nature of the shale production process, but additionally he predicts that the shale gas story will be another bubble on the verge of popping. 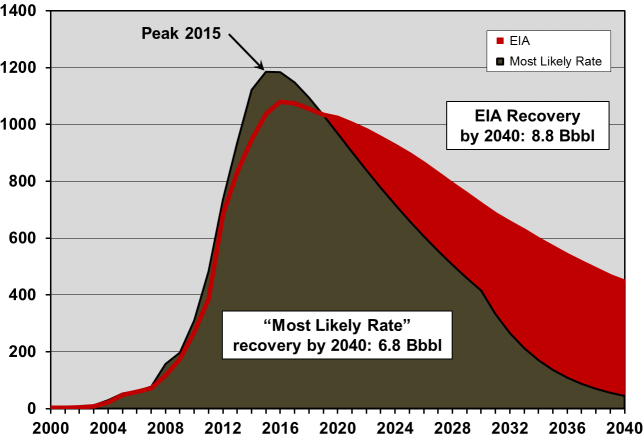 Engdahl shows that talk by president Obama of another 100 years of recoverable reserves is deceptive and that we should anticipate 11-23 years at current consumption rates at best. Slate, that’s the Washington post or a MSM. And the article linked to is remarkable, since most MSM share the feeling of excitement in the light of the prospect of a new oilboom in America. Slate is not convinced and attacks a report by Leonardo Maugeri, the most optimistic of all cornucopians. Sure there could be up to 2.7 trillion barrels worth of oil underneath the Bakken, Eagle Ford and Green River shales, but only a tiny fraction of that can be recovered. Think 1-2% for the first two regions (2 years worth of US consumption) and an unknown quality for Green River. A drilling project is planned whereby the fracking will take place with a thick propane gel instead of water/sand/chemicals to reduce pollution (LPG fracking). The gel returns to the surface as vapor and is recovered. Chemicals contained in the gel do not return to the surface. 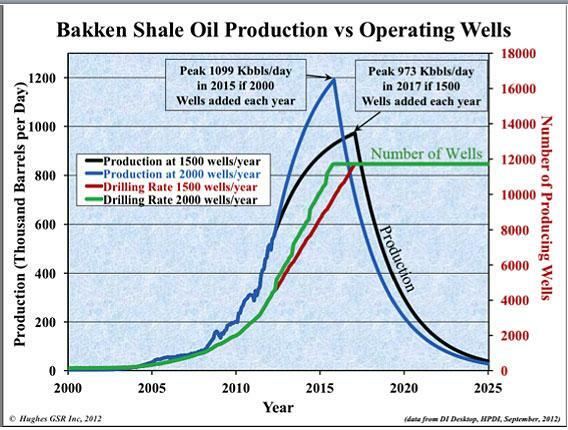 Additionally there is talk of “spectacular rise in well production”. Reports from the Cardium formation, which is west of Edmonton, displayed that LPG fracking results are “two to three times better” at increasing the flow of oil and gas in comparison to traditional methods. The Netherlands is a natural gas country. Nearly all 7.1 million homes are connected to the natural gas grid, that to a large extent is being fed by a giant gas field near Slochteren, discovered July 22, 1959. Original total content was ca. 2.8 trillion m3 or 96 trillion ft3. By 2008 these reserves had decreased to 1.1 trillion m3. It will not be long before the impending end of Slochteren will make itself felt, energetical… and economical, as the original amount of gas represented 1.5 trillion euro against present day consumer prices. 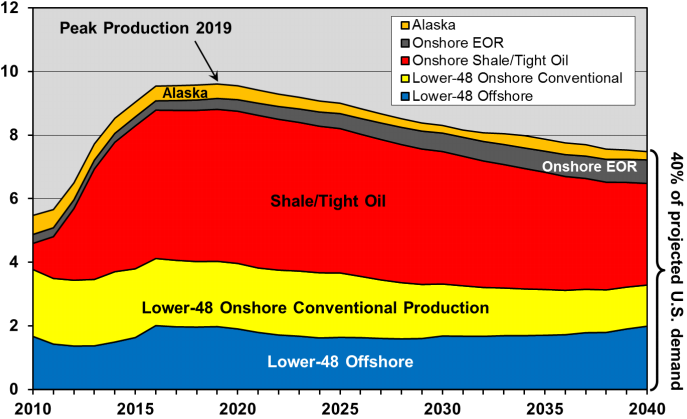 So what’s next… shale gas? Much is unclear about the potential of shale gas/oil in the Netherlands. [energiepodium.nl] – August 19, 2011: shale gas reserves in The Netherlands range from a few hundred to 3000 billion m3. A lot of questions arose after the documentary Gasland was released. Frank de Boer, director of Cuadrilla Resources acknowledges that a lot went wrong in the US but that that is not bound to happen in the Netherlands. [energeia.nl] – British company Cuadrilla wants to carry out probe drilling in Boxtel but meets fierce local resistance. The status as of September 2012 is that Cuadrilla still needs to wait for the results of a study by the Dutch government. 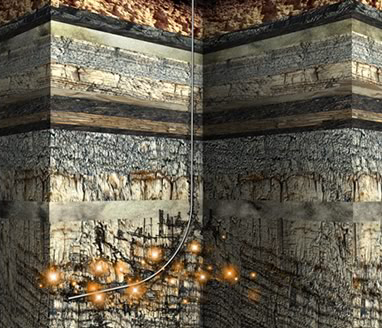 [fracking.velaw.com] – The Netherlands has approximately 19 trillion cubic feet (540 billion m3) of technically recoverable shale gas reserves, according to the U.S. Energy Information Administration. 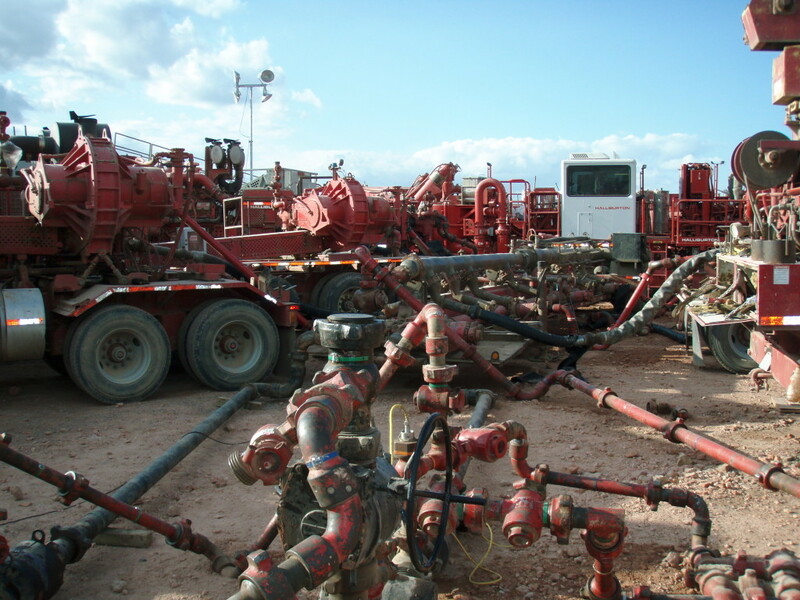 The European parliament wants to regulate, not ban shale gas. The prospect of large scale shale gas development in Europe is complicated by land ownership rules, higher population density and environmental concerns about the fracking process used to extract natural gas from shale. The EU clearly did not want to embrace shale gas as a critical instrument of solving future energy problems, but wasn’t prepared either to dismiss this form of energy. Praise for the EU attitude came both from fracking proponents as well as environmental organizations. Mike Aucott shows us that the EROI value of shale gas could be much higher than is assumed by many, namely in the range of 70-100+. He arrives at his conclusions by making use of CO2 emission data related to drilling for shale gas, which he uses as a measure for the amount of energy used to extract the shale gas. Energy necessary to produce the drilling hardware and related equipment is included as well. Aucott estimates the total energy cost for a shale gas well at 30 billion Btu. Another method of calculating the energy cost is to start from the financial cost of a well and translate that cost into energy cost, using the average amount of energy associated with a dollar of gross domestic product (GDP). Result: 35 billion Btu. A typical Marcellus well yields an estimated 2.9 billion cubic feet and thus Aucott arrives at EROI values of 70 or higher, which is extremely good. Aucott concludes that shale gas is not a bubble, but here to stay. And that gas is bound to overtake petroleum in the years to come. But at the same time he doubts that shale gas reserves are big enough to replace oil in the role it plays today. At the same time he points at dangers: gas leaks and its effect on global warming, surface water/drinking water well pollution by flowback fluids and/or gas itself, explosion hazards. – Wikipedia – Oil Shale – Study from 1984 indicates EROEI values between 3-10. – Executive summary refers to study by Adam Brandt, giving EROEI values like 2.5 for shale oil. We are no friends of shale gas/oil as it has the potential to poison the lands exploitation is practised on. But that does not garantee it is not going to happen. Here is why. But first we consider what a barrel of oil factually represents. 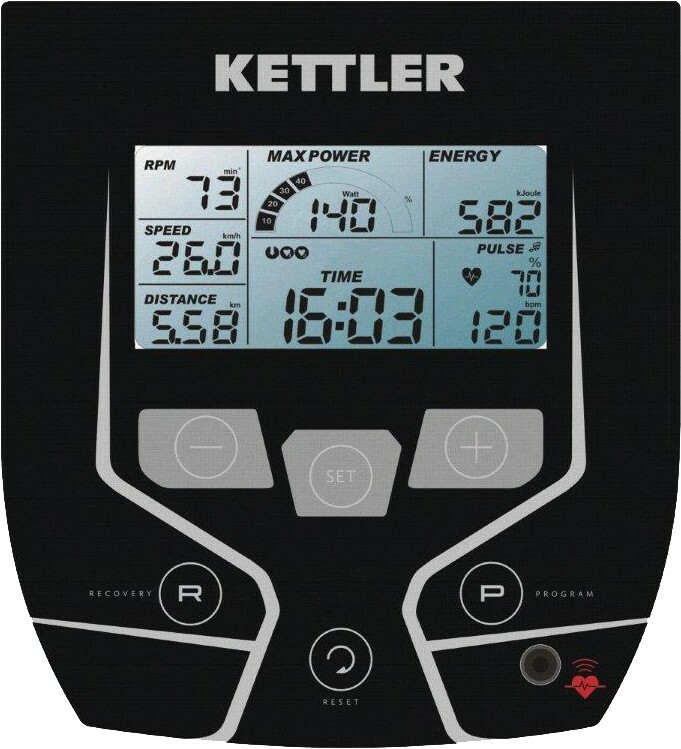 Imagine you have a hometrainer with metal grips and a display as shown in the picture. You click your iPad in a holder so you can watch a number of youtube videos you have collected during the past few days and off you go. You have configured the apparatus such that the effort is high, but not that high that you can’t concentrate on the videos. The room where the hometrainer is located is not heated, which means that the temperature in the winter is ca. 10 degrees Celcius. After five minutes the display says pulse = 100 and generated power = 100 Watt. By that time you pull off your shirt as you have generated enough internal heat to no longer feel discomfort from the 10 degrees Celcius room temperature. After an hour you are finished, a little tired, but not exhausted. You produced 100 Watt * 1 hour = 0.1 kWh. Market value in the US: 1 dollar cent (double that in Europe). In order to produce 1 kWh it would require you to sit on the thing for 10 hours, that’s much more labour than any western trade union would allow to happen. Market value of the electricity fruits of your labour: 10 dollar cent for a hard days work. How many kWh are contained in a barrel of oil? Answer: 1628.2 kWh. A year has 240 workdays. We just figured out that a man can produce slightly less than a kWh per day. This means that one barrel of oil contains the amount of energy the equivalent of which would require you to be glued to your hometrainer for a whopping eight years. Market price one barrel of oil ca. 100$. Back to shale. If a team of say 20 drillers is able to produce 500 barrel a day, then they convert 20 man days of physical labour into 4000 man year of physical labour equivalent, that is a (redefined) EROEI of zillion. Take into consideration additional labour to produce the drilling equipment, the drivers of trucks carrying all that water and fracking fluids and allow for a factor of three (we are guessing here) and we still have a (newly defined) EROEI of zillion. In the end all costs are labour costs as mother nature does not charge for resources, at least not in dollars. That is the proper way of looking at it and not the volatile financial side of it, which to a large extent consists of high labour costs. If you consider that an average Ukrainian makes 500 dollar a month and an American oil worker maybe 5000$ a month… and both survive… and that Americans are not ten times as good/productive/efficient as Ukrainians, then it is not difficult to guess that after a great default American oil workers could also make 500$ a month (in present day value) and that from that moment on the price of shale oil could come down considerably with collapsing wages. Moral: the question whether shale oil will be exploited or not is determined by EROEI in terms of human physical labour equivalent and not volatile finance. The only hope that remains for fracking not to be applied on a grand scale is that the cost of solar and wind will be lower than that of fracking, otherwise we are ummm… fracked. P.S. these considerations only apply if one can ‘harvest’ more energy than it takes to produce the harvest. In fact the energy costs for the production of shale oil are relatively high. Wikipedia cites a study from 1984 estimating EROEI values for shale oil 3-10. A more recent study by Adam Brandt even gives a figure of 2.5. We don’t know where the EROEI tipping point is, below which nobody will bother to extract the shale oil from the ground… 2? 3? 5? 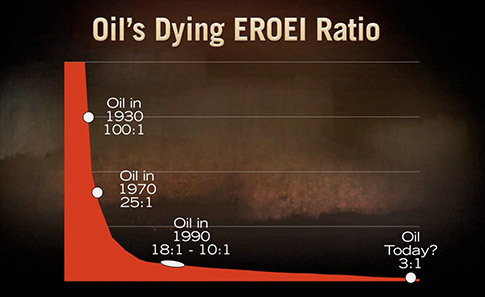 But considering the enormous energy content of a single barrel of oil, that EROEI value will not be very high. By that time you will certainly not be driving 50 miles to a house party. The scarce amounts of oil will be used for more pressing tasks like ploughing and harvesting. Pictures can probably be better viewed on the original site. 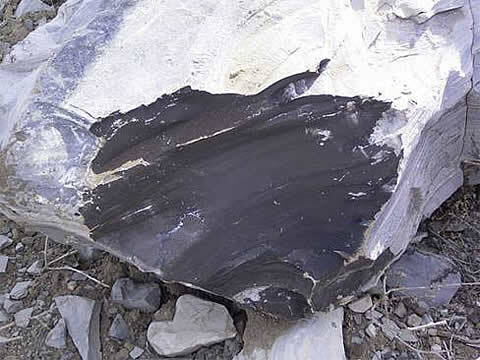 Oil shale, also known as kerogen shale, is an organic-rich fine-grained sedimentary rock containing kerogen (a solid mixture of organic chemical compounds) from which liquid hydrocarbons called shale oil (not to be confused with tight oil—crude oil occurring naturally in shales) can be produced. Shale oil is a substitute for conventional crude oil; however, extracting shale oil from oil shale is more costly than the production of conventional crude oil both financially and in terms of its environmental impact. Deposits of oil shale occur around the world, including major deposits in the United States of America. Estimates of global deposits range from 2.8 to 3.3 trillion barrels (450×109 to 520×109 m3) of recoverable oil.